Ten Tec Scout good for portable operation! 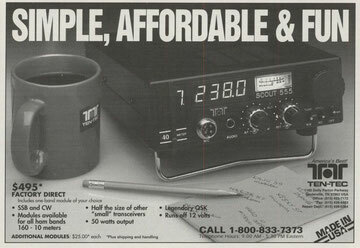 i will present to you a very little, economic and fun trasceiver from ten tec radio equipment! The Ten Tec Scout 555 its more inexspensive but its very good for mobile operation and portable station. The band are changed by the module bands in use, the output is 50watt but there is possibility to setup at 5 watt. Good and simple are his skil, built in a good SWR to look up the antenna risonance! try it if you want a good "FRIEND" for operation outside home. Good blog is great, giving inspiration is extraordinary.